Canned tuna may be more dodgy than other forms of protein, though. Consider the mercury/shipping/packaging factors. Could you not do as well trying some pickled herring or a shredded tuna steak with a box of crackers? I could not nor would I dare run a marathon (or even a half-marathon) in weather below 30 degrees F. The air is harsh on the lungs, for one. It’s also no peach running in weather hotter than 60 degrees. So, in short, I’m not much of a marathon person. 🙂 I’m the cheetah that runs a short sprint when life requires, hoping I don’t do what happened last year, chasing nephews to my doom. I was thinking about that. Makes me want to just swing back to being vegetarian. I swing close to being a vegetarian but still feel the need for weekly meats, usually lunch meat sandwiches for quick meals and the occasional spaghetti and meat sauce or pepperoni pizza. Most other meats I can get by without. A lamb gyro is nice, once in a while. And, if it’s meat, I do like fried calamari in marinara sauce. Wait! 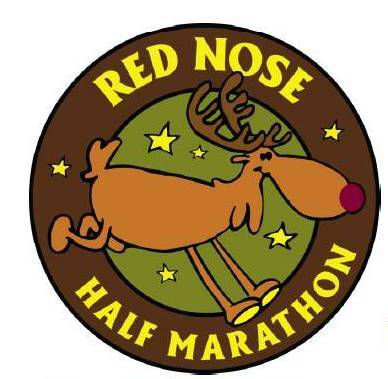 How much did the Red Nose Half Marathon cost?? LOL! Yeah, ‘free’ is a platinum word, isn’t it? Good for you for getting out there in cold weather. That’s dedication. How is the Crossfit going? I’ve always been way too intimidated to set foot in a box. Yas!!! !Free is a word that makes me feel warm and fuzzy inside!!! CrossFit is fun. It can be a little frustrating to know that I can’t pick up the same heavy weight like I used to do. There are a lot of sketchy boxes out there, but once a person finds the right one, it’s magical. They are all FREE on Saturdays mornings. Oh me, I just made myself laugh. I loved Outliers! It was so interesting! I feel ya on that January half marathon, if it’s under 20 degrees I can’t get myself to go outside! The crazy part is that this Saturday’s run is in the 50s with a chance of rain. Bookworms unite!!! That was the temperature the day of the race. I survived! !